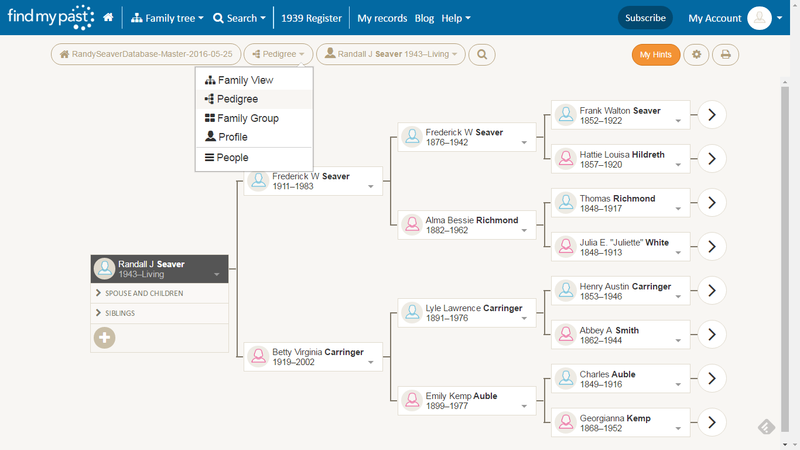 When I wrote Uploading a GEDCOM File to a New Findmypast Family Tree last week, I had confidence that the GEDCOM upload would be successful, and then it wasn't. During the rest of the week, I tried six times and it failed every time. I received an email late last week that said essentially "we fixed it, please try again." I did, and it didn't. 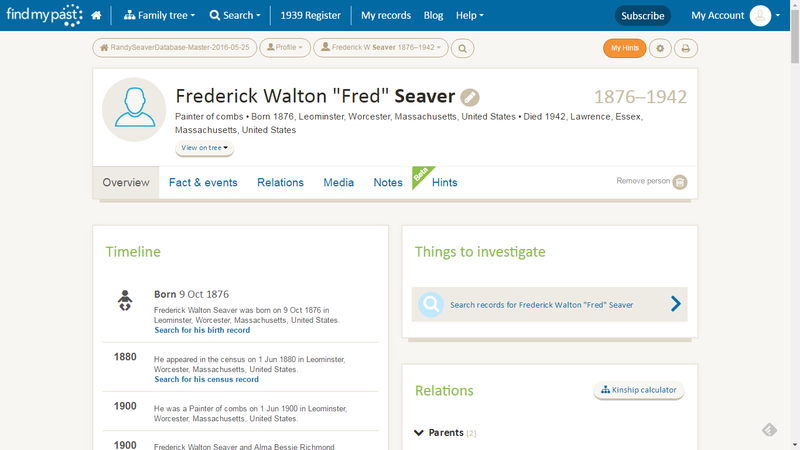 After I wrote the blog post noted above, I received another email from Findmypast that said "if you are not able to upload your GEDCOM file on the website, please send it to us using the support@findmypast.com email." 1) For the record, the GEDCOM file I created was limited to all events, notes and sources in my RootsMagic database - no multimedia links, no RM specific extra details, no LDS, no addresses, no to-do lists, no research log, no correspondence, etc. 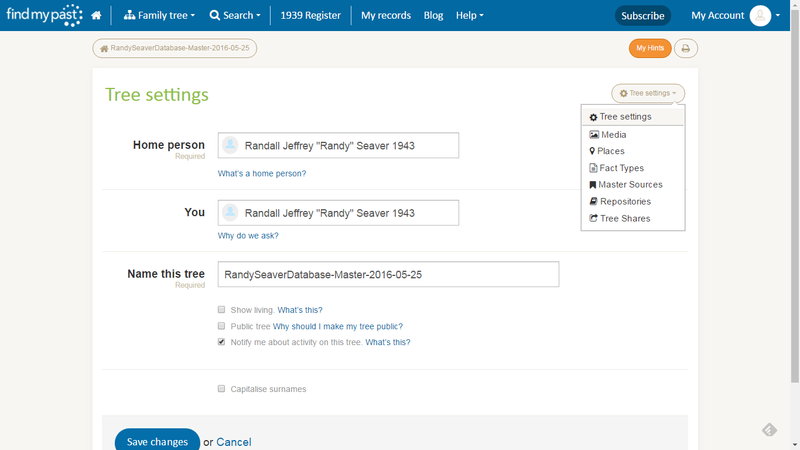 It was a GEDCOM Version 5.5.1 file. On Saturday, I put the GEDCOM file in Dropbox and sent it to Findmypast. 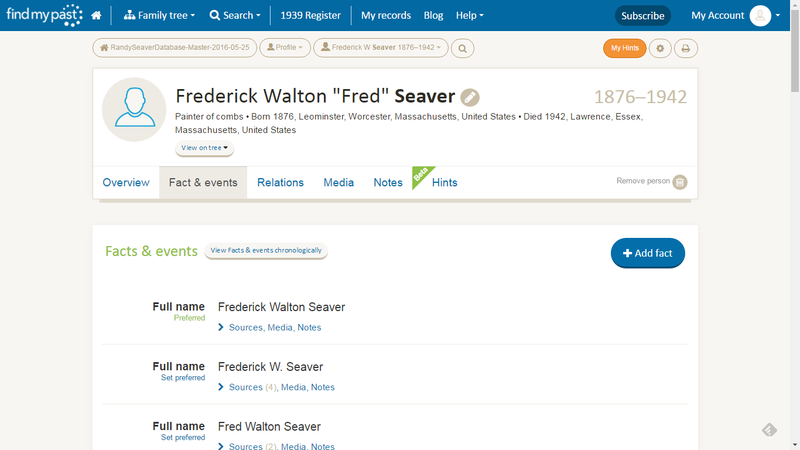 2) Today, when I looked at Findmypast, I saw that my GEDCOM file had been uploaded. Now I wanted to see if there are Hints already found for my tree persons. The new tree is the top one - it says that it was created in 6h 54m 54s on 28 May 2016, and has 46,059 persons in the tree. 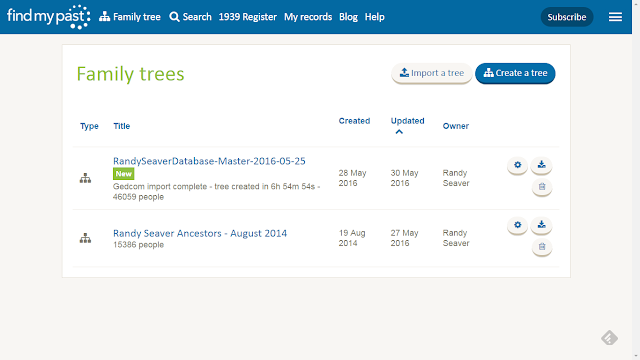 The second one is my old tree from 2014 with only 15,386 persons that I uploaded in 2014 (it has 18,214 Hints). 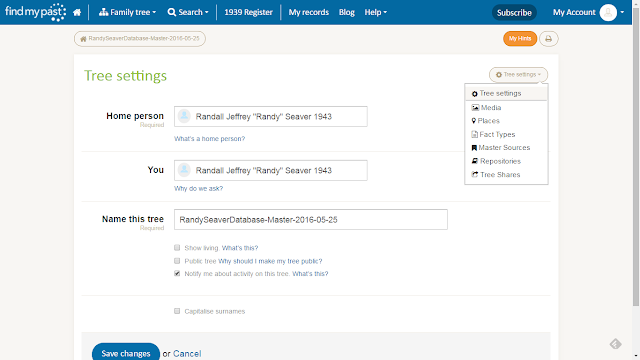 I also clicked the box for "Public tree" and "Notify me about activity on this tree." I find the Pedigree view much easier to navigate in because the Family View requires use of the bottom and right-side scroll bars to move around the tree. I much prefer a "drag-and-drop" capability. This card provides basic vital information and relationships, and has links at the bottom for "His Tree," "Profile," "Edit," "Add relative," "Search" and "Hint." The number of Hints so far provided by Findmypast for my 46,000 tree persons is 132 (the number is next to the title of the family tree). There seems to be no way to determine how the persons are chosen - there are 62 persons right now on this Hint list, with 132 Hints. some have more than one. Hints on any screen will be shown in an orange circle, as shown above. 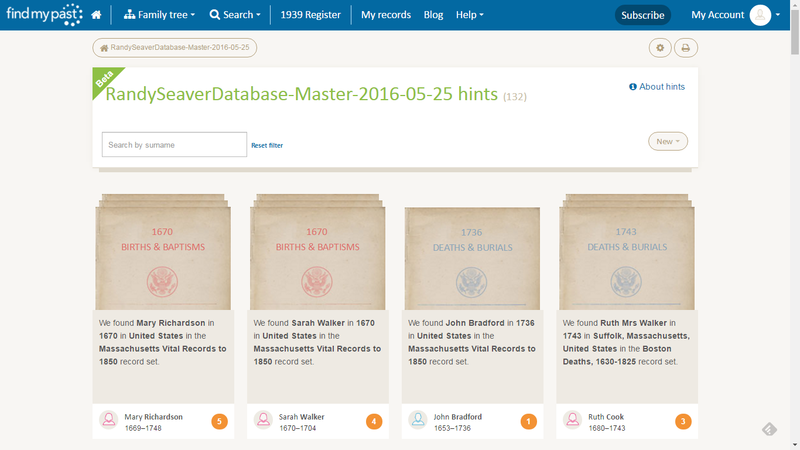 5) In an online Chat on Thursday morning last week, Findmypast staff indicated that Hints are obtained from Findmypast record collections for vital records (birth, baptism, marriage, death, burial) and census records. They said that these records are 80% of all of their records. Apparently, Hints are not obtained from Military, Migration, Citizenship, Voter, Directory, Tax, Probate, Land, Newspaper, Books, etc. 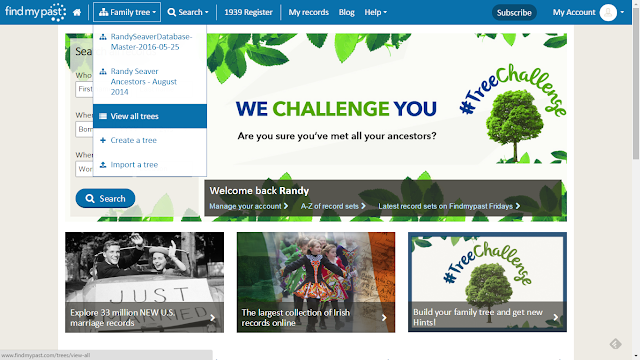 The contest seems a bit in question if folks can't upload GEDCOM files. Not to mention the limitations in available databases. 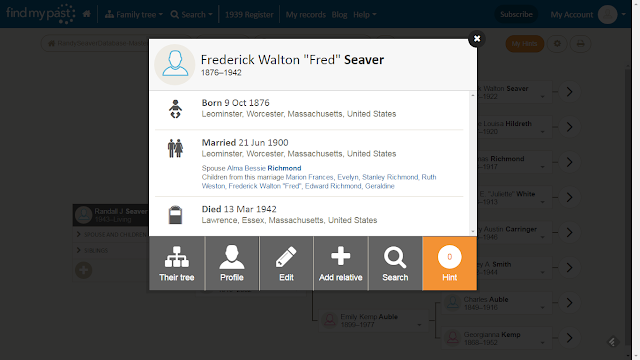 I uploaded a 25-person GEDCOM just to have something to play with - got 2 hints; FINDMYPAST website hung while I was attaching 1st, and hint never reappeared when I reconnected to website - despite 2 chats with customer support, never fixed.